SANTA CLARITA, Calif. – A service was private for Ms. Margaret Cusick, 80, of Santa Clarita, formerly of New Jersey, who died here Wednesday in the Santa Clarita Nursing Home. 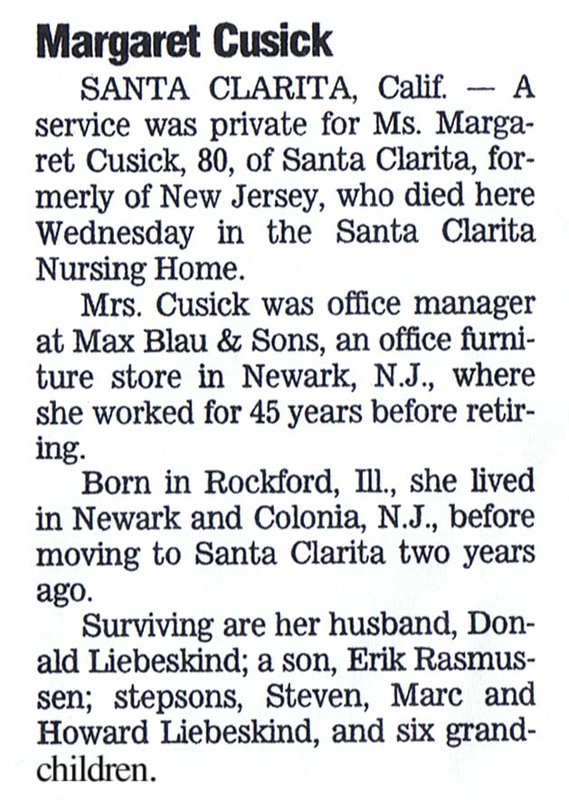 Mrs. Cusick was office manager at Max Blau & Sons, an office furniture store in Newark, N.J., where she worked for 45 years before retiring. Born in Rockford, Ill., she lived in Newark and Colonia, N.J., before moving to Santa Clarita two years ago. Surviving are her husband, Donald Liebeskind; a son, Erik Rasmusen; stepsons, Steven, Marc and Howard Liebeskind, and six grandchildren.